The Best Baked Pork Chops | Mexican Appetizers and More! Make these perfect Baked Pork Chops in the oven. Guaranteed to cook perfectly tender and juicy with just a few simple techniques. No more dry oven baked pork chops! 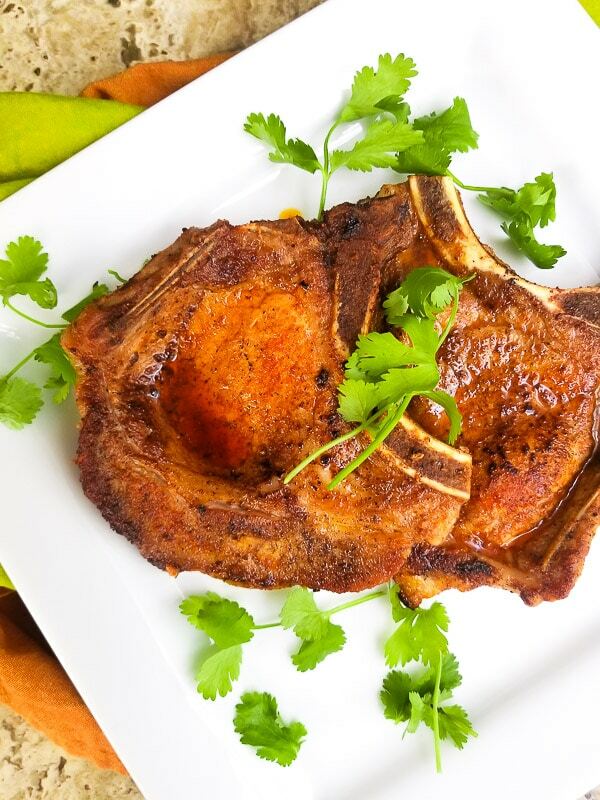 These juicy tender Baked Pork Chops are excellent! Savory, succulent, just perfectly tender and juicy! Follow the steps in this simple recipe and I guarantee you will also agree! Unfortunately oven baked pork chops always seem to get a bad rap because they can easily dry up in the oven. But I promise there are some really simple tips and tricks to overcome this dilemma. 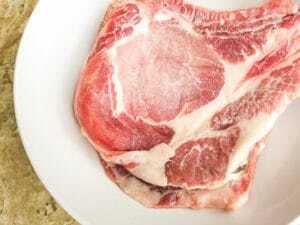 A lot of cooks believe that in order to avoid dry oven pork chops, you have to buy thick chops and cook them for 20 minutes and they will come out perfect. Other cooks suggest stuffing your pork chops and this technique will keep them tender. For some there’s another dilemma. Pale pork chops that don’t look very appealing or appetizing. Well I’m here to say you don’t need 2 inch pork chops or pale ones either. Although thicker pork chops is ideal for oven baked pork chops, it is absolutely not necessary. What I do almost insist on is choosing pork chops with the bone in. They just make for juicier, tastier pork chops. When it comes to oven baked chops, I like the seasoning to be simple, I like to keep true to the flavor of the pork chop. So I simply add salt, pepper, garlic powder and paprika. You however can season your chops whichever way you like. First rinse the the pork chops and then let them sit in a brine of salt and water for 30 minutes. If you don’t have 30 minutes to spare, at least make sure to marinate them in the brine for 15 minutes. This step is important because it tenderizes the pork. Rinse again with cold water and then season. Let them sit for a few minutes. In the meantime heat an oven proof skillet over medium high heat. (I use a cast iron) Add one to two tablespoons of oil. Add the pork chops and sear on each side for a few minutes to give them color. Look how perfect they look already. Finish cooking the pork chops in the oven. Pork chops are done cooking. They are perfectly juicy and tender now. 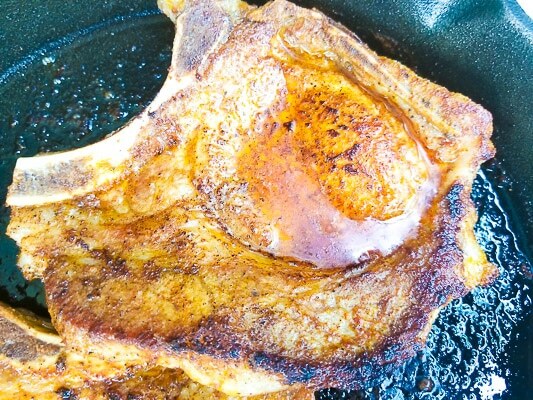 ** Let the pork chops sit for a few minutes before serving to hold in the juices the same way you would with a steak. Note: If pork chops are half an inch thick, cook for 10 minutes or until internal temperature reaches 145 degrees F. (62 degrees Celsius). Rinse and brine the pork chops in the brine solution for 30 minutes. 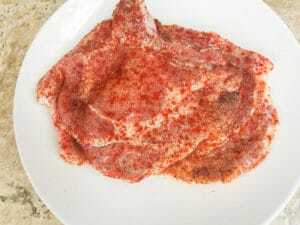 If you don't have 30 minutes, brine for at least 15 minutes. 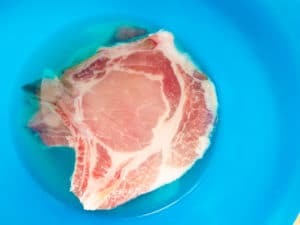 Remove pork chops from brine and rinse with cold water. Season and let seat for a few minutes. Add one to two tablespoons of oil. 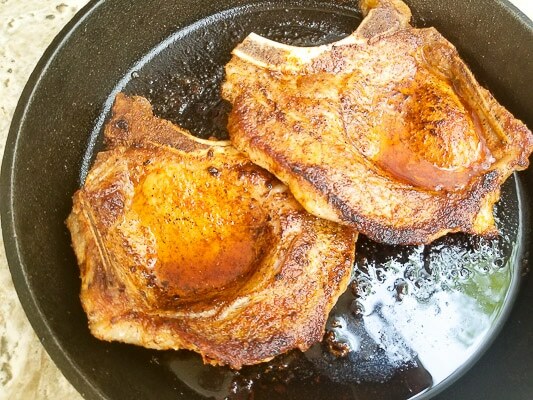 Let the pork chops sit for a few minutes before serving to hold in the juices the same way you would with a steak. Serve with rice, potatoes or veggies or take a look at my other suggestions in the post. I love pork chops! Looks so delicious and perfect for dinner! Yes they are Natalie! Cheers! Thanks for the great tips! I often overcook my meats in the oven and they get dry so this is very helpful! I LOVE Mexican seasoning so you have really got me with this one! Pork and mexican seasoning, yum. The step by step photos are great, cheers! 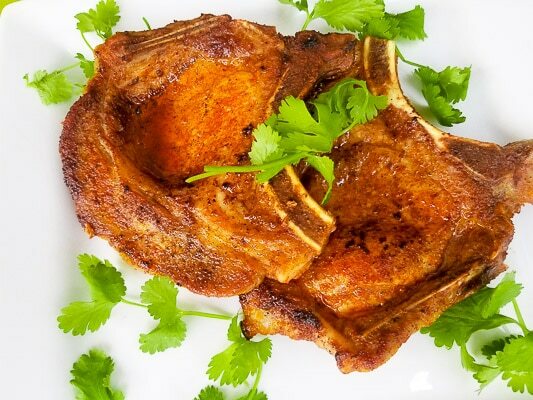 My husband is a big fan of pork chops and this recipe looks like a perfect combo of intense flavour and tenderness. I’ll give it a try – and thanks too for the sides suggestions. I always have trouble with pork chops getting dry, so I’m excited to try your recipe ~ I love the quick 30 minute brine! Such delicious dishes are always a welcome home to my family. They to relish it. Have to try it for sure. 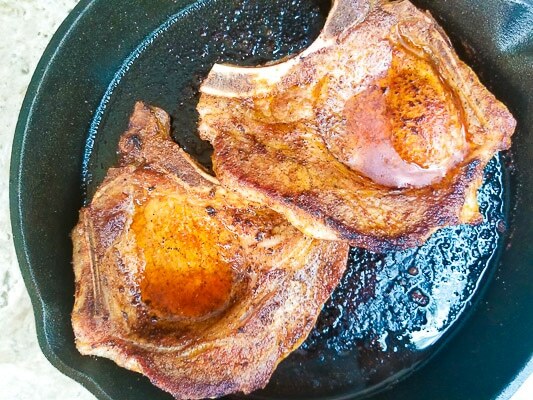 I love these brined pork chops! So easy and tasty. 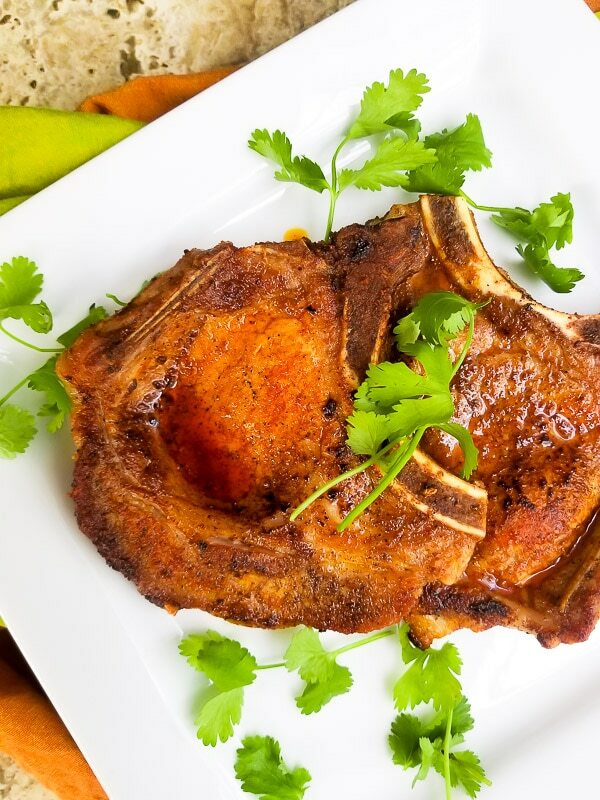 Pork chops are amazing and so versatile and so yummy, loving the condiments you used for seasoning and that this can be made in such an easy way. Delicious weekly dinner for sure! Thanks Adriana! Yes these are so easy and come out just perfect!